Heirloom tomatoes are here! This week, I got a massive one. Heirloom tomatoes are known for looking a bit… crazy. They’re different colors and not the perfect round tomatoes that you see in the grocery store. I did get some “perfect” roma tomatoes this week as well. While I was on vacation, I missed two farm share pick ups. One I gave to my friend Naomi, and for the other I signed up for a vacation hold. That meant that I got to elect for a double box another week, which happened to be this week. 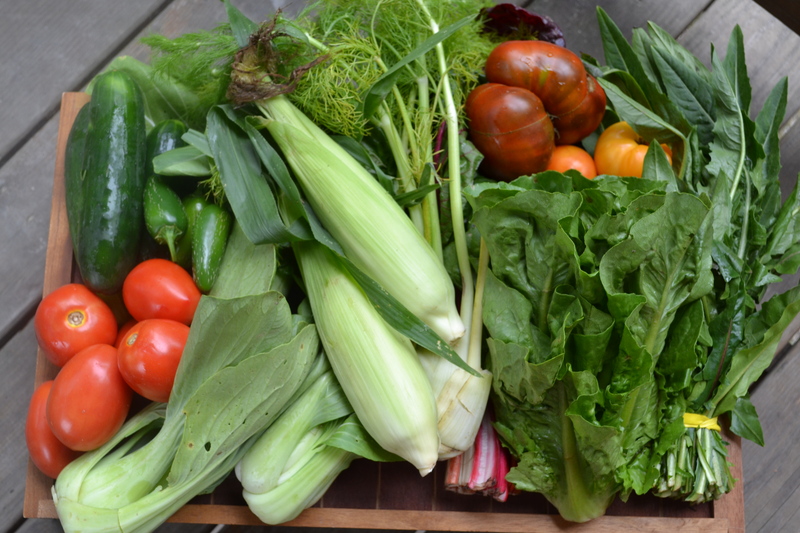 So in addition to the box pictured (which I picked up two weeks ago after getting back from vacation), I picked up a double share last week with very similar vegetables. Hence the tomato overload. Solution – tomato sauce. It’s easy to make and easy to freeze (in a plastic bag with all of the air squeezed out) for later use. The recipe I use isn’t quick but it doesn’t really need much attention. It’s a good recipe to make on a Sunday when you have some things to do around the house. Just let it go on the stove and stir occasionally. Miso soup with roasted bok choy, rainbow chard, Portobello mushrooms, and tofu. New obsession: miso paste. You can find it in the Asian food section of your grocery store and have miso soup in under 5 minutes. Marinated tomato and cucumber salad over romaine with corn, shrimp, and cilantro. In a large saucepan, saute ½ diced onion in 1 tablespoon olive oil until translucent. Add ½ tablespoon of your favorite dry Italian herbs (I use a combination of oregano and basil) and cook for a few minutes. Add 2 cups chopped tomatoes and 1 tablespoon salt. If the tomatoes are really juicy, remove the seeds from half of them before adding to the sauce. Also, no need to make this a pretty chop – leave the skins on and just rough chop them into 1 inch pieces. Cover and cook over medium heat until the tomatoes soften, then remove cover and let reduce for about 15 minutes. Remove from heat and blend (I always prefer a hand blender – less mess!). Put back on the heat and add ½ cup wine. You can use red or white – white gives it a brighter taste (more like a marinara), and red gives it a heartier taste. Simmer over medium heat for about 15 minutes until the wine cooks down. 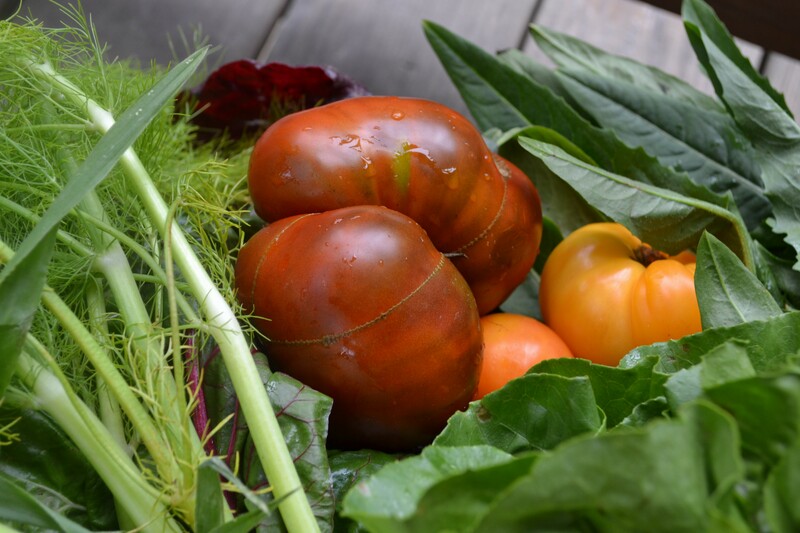 This entry was posted in Vegetarian and tagged agriculture, community supported agriculture, CSA, farm, farm share, heirloom, heirloom tomato, Tomato, tomato sauce by cooklikekayla. Bookmark the permalink.